We woke Sunday morning to the sound of heavy rain. Avoiding each others eyes, we quietly crawled out of our beds to pack our panniers and load the bikes up, knowing we had a schedule to keep. The hostel kitchen was empty in the morning, we heard there was a big kerfuffle on the third floor at 3am which kept everyone awake..a friend never made it back to the hostel and the bus was leaving. We had a bit to eat by ourselves and made our way out. The rain had stopped and the streets were quiet as we zigzagged our way south out of Austin. We love riding through the neighborhoods in the morning, and it took us a few hours to actually get out of the city. Hispanic churches were filling up, we could hear the sounds of singing filling damp air. We found the riding not so bad, the roads were chip sealed and narrow, no shoulders but the traffic was light. We were caught in sudden bursts of rain, but it was not so bad. The garbage along the roads was quite remarkable, like nothing we had ever seen. Not just beer cans and McDonalds bags but mile after mile of mattresses, tvs, old furniture, bags of garbage. We came across a freshly hit wild boar (interesting!!) lots of roadkill and vultures by the thousands with their wings outstretched, very creepy and still. We were headed to New Braunsfels , thinking it would be an easy 42 mile ride according to our gps. While sitting out a downpour in a gas station 30 miles in we found we had miscalculated by about 20 miles..making it a 62 mile day. Psychologically we were bummed. Time to go off route and head to San Marcos, a more doable 47 miler. We had our first flat tire (me). It was glass. Mike is so patient! Making it into San Marcos we found a hotel with crispy cotton sheets (my favorite) We cleaned up and headed into town for a nondescript meal in a nondescript restaurant with a great beer selection! Hoping to see the bluebonnets we were promised, but we may be to early in the season. We spent Saturday exploring Austin by bike, very easy since the bike lanes downtown are A-mazing really. We first hit up Lance Armstrongs favorite bike shop, Mellow Johnnies. We don’t know if he really goes there but the shop had his yellow jerseys on display and a few of his bikes. Cool. And they told us it was his favorite so there is that. We then went down to Lady Bird Lake and took the bike path all the way around. Ten easy miles. The paths were crowded with cyclists and walkers and the lake was full of kayakers and standup paddlers. Lady Bird Lake is really a reservoir created on the Colorado River in 1960 to cool the power plants, but it is well used recreationally. It really speaks to the value of adding parks like this to a city. So well used. There was art along the way…hey, it’s Stevie Ray Vaughan! Interesting thing happened, The band Foreigner was in town and his roadies were there taking pictures so we helped them out. I know, always hanging around with the rich and famous! The most amazing thing were the dog parks along the path, large open spaces along the river with hundreds of dogs diving in and playing together. No fences. So wonderful. a nap and shower and we went off to find some good Texas Soul Music. And we found some! First off, a word about the blog. We write this not as a real narrative or anything, just an open journal so we can remember our adventures as we get even more forgetful. We want to remember things we found fascinating or worth remembering, and it may or may not be that interesting to anyone else. 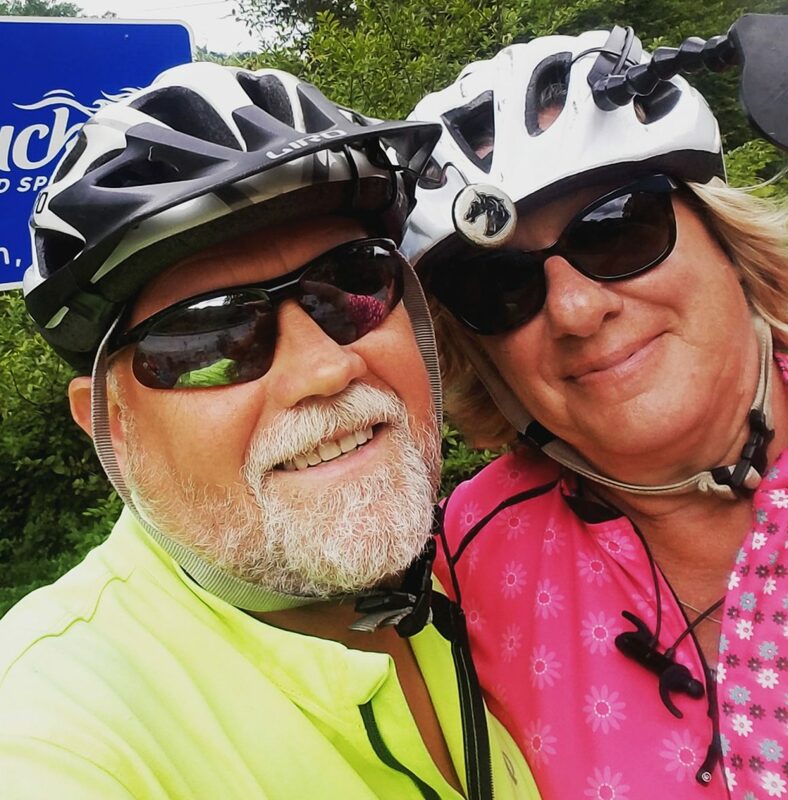 It should be named “Mike and Deb on a Bike” or something, but we are going to leave it as is, since I have my own blog and we just decided to use Mikes blog to journal. Saying all that does free us up to write about restaurants we loved or people we have met, or funny things that have happened between us, without being concerned if it keeps anyone else interested. That being said, we were still on the train Friday and we had the whole car to ourselves! We spread out, MIke reading and listening to podcasts (Mostly Slow Burn, a fascinating account of Watergate) and I spent the hours knitting and listening to my podcasts (I love NPR politics, Pod save the World and The Daily) I have been knitting keps lately using a pattern and yarn from the island of Fair Isle, the patterns used were traditionally used in the knitted hosiery of fishermen. I purchased the pattern directly from the museum on the island and am using pure shetland wool. It is addicting! This one needs its traditional tassel yet. Anyway, that is how we spent our lovely quiet afternoon. We arrived in Austin ahead of schedule and quickly found the hostel we were staying at Firehouse Hostel. We had a small coed room with two set of bunk beds, but little did we know when we reserved the room we were staying on 6th street. An area of Austin which makes Beale St in Memphis look tame. The noise! At any rate we enjoyed our roommates and it was better then staying in a sterile chain hotel by ourselves so all was good. After settling in we headed to an area of Austin called Rainey Street. A neighborhood of historic houses turned into restaurants and bars, lots of food trucks and music. We took the pedicab and as proud as we are of Grand Rapids, we thought that night we wished they would lighten up on the restrictions for food trucks and pedicabs and dogs on restaurant patios. It adds so much flavor. Such friendly people we met. What a nice night. We headed back to the hostel and slept um…fitfully. After our amazing trip last summer out west, Mike and I decided to continue our ad ventures with just a few changes…like a new bike for me! Over the winter we purchased a Surly Disc Trucker and Mike modified it to fit our needs. It is gorgeous, and I was so eager to try it out we decided to do a spring ride. We also thought it would be a good way to kick off the 2018 cycling season. Adventure Cycle Organization recently mapped out Texas Hill Country, a 311 mile loop around the Austin Texas Area. They recommended going in March to enjoy the renown wildflowers in bloom so we just picked a date and made train reservations. That is a good way to get things started we have found. Just buy tickets. Yesterday morning we loaded our bikes on the train in Holland MI for the roughly two day journey, which includes a four hour layover in Chicago. Train travel is so easy with a bike, no boxing..they just secure it in a special room and we are off. It has been raining record amounts in the midwest which has caused a small delay in our travels, we watch miles and miles of flooded landscape go by from the observation car. We decided to go without a roomette this time, and as I write this we both feel like it has been quite doable. The seats are large, the train is not crowded and we can spread out. Saying this, I must admit we are both ready to just be in Austin and get the kinks out. Starting to see leaves on the trees from my train window. So refreshing.